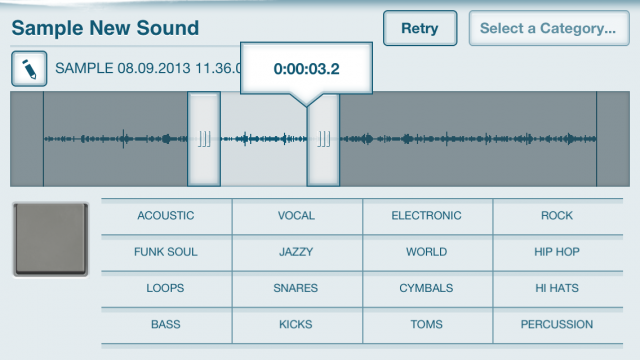 Akai’s iMPC, already available for iPad, now comes to a palm-sized iPhone version. Say “MPC,” and what comes to mind is a big, solid piece of hardware – a pickup truck of a drum machine, all metal beneath its rubber pads. And yet, a whole lot of what an MPC can do is now on your phone. 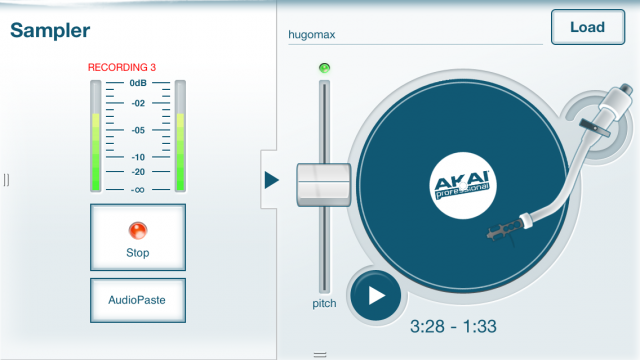 Akai’s iMPC is available now for the iPhone. At a US$2.99 intro price, this one’s pretty much a no-brainer, but here’s a look at what the app does. As with Akai’s other iOS efforts, the app is developed by seasoned iOS devs Retronyms, so you get a beautiful, polished app from the makers of Tabletop. The interface is skeuomorphic, mimicking real hardware, but never in a way that’s overstated – it mostly makes the UI easy to read. (Skeuomorphism has been much maligned in the design community of late, but in sparing amounts, seems to work perfectly well for music software.) And that UI works well, though the problem isn’t how it looks – its that sometimes it’s too hard to get to parameters (like switching what the Variation fader controls), or they aren’t there at all (cough, sampling levels). I’ve been trying out iMPC with that in mind. It fits a nice niche, and it could be the best option for Akai fans. The bad news: iMPC actually falls short of the two-year-old iMaschine in some key respects as a simple drum machine, and behind BeatMaker for breadth. This is just a very brief first hands-on preview, not a review, but with some screenshots you can get an idea of where this app fits in. 3D perform mode uses tilt with parameters, taking advantage of the handheld form factor. See also various modes on the left. Three beautiful Retronyms-developed effects round out the package. Manipulate sample in and out points and assign metadata. You get a lot of sounds. There are 600 samples in the app to get you started. 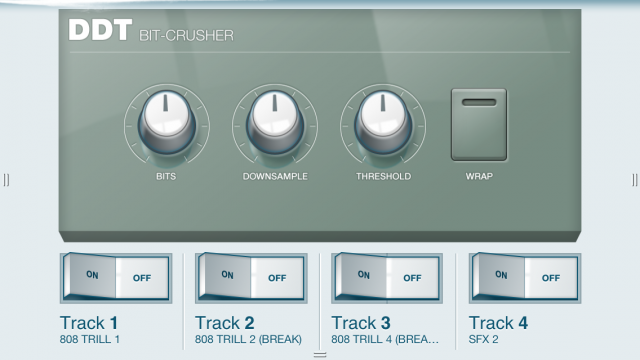 You can sample into pads. Sample from the mic, a line in, or load up tracks from iTunes and sample them via a cutesy turntable UI (see image). The mic sampling works similarly to iMaschine’s (with some unfortunate caveats). But the track sampling is loads of fun, and it means I’ll be using iMPC to resample some old tracks of mine on the go and turn them into new kits. 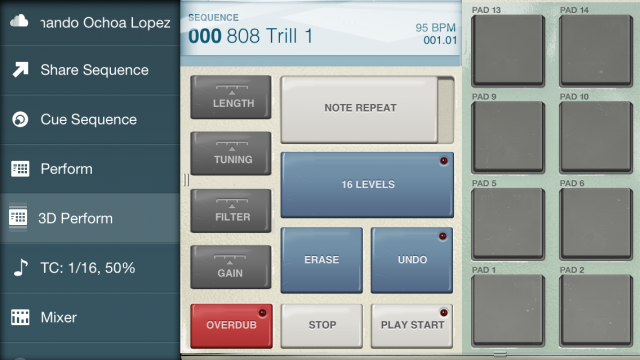 And (cough, iMaschine) you can easily set in and out markers for samples. MPC performance features are built-in. Note repeat is there, of course, and there’s also a variation slide with the ability to drag parameters up and down (like the filter or length), or map parameters across 16 pads. These features can get a bit cramped at times, but it’s still possible to perform most of what you’d want. There’s also a unique 3D performance mode that uses tilt sensing. There are some nice built-in effects. You get a tempo-syncable delay, bit-crusher, and compressor/limiter. Nothing new, but Retronyms’ implementation and UI are rather nice. You can cue up sequences. Here’s where it’d be useful to use iMPC alongside other tools. Built-in sharing. SoundCloud, Facebook, Twitter, Tumblr, and WAV export are built-in, and Akai promises the ability to share tracks with MPC Renaissance and MPC Studio software. 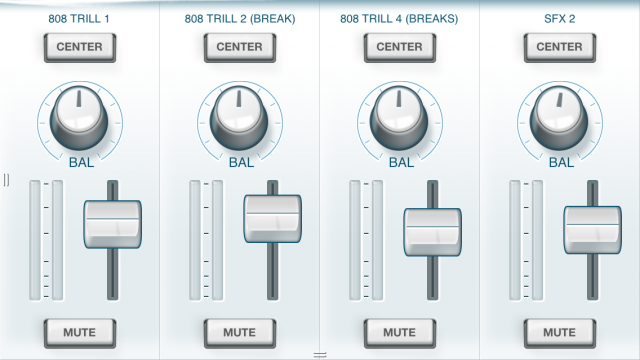 The Sampler module lets you record from mic, line, or – via the virtual turntable at left – tracks from iTunes. The iTunes sampling is a nice feature, but notice that there isn’t an input setting on the meter at left. That means you can trigger based on a transient, but you can’t adjust sensitivity – ugh. Unfortunately, iMPC maddeningly reproduces some of the frustrations of rival iMaschine, while actually failing to fully match up to my favorite feature. There’s no level setting for the impulse threshold. You’ll see a meter while you’re sampling, but you can’t adjust what threshold will trigger sample recording. There’s also no visual feedback as you capture multiple samples. That means for now, I can’t replace iMaschine with iMPC. No MIDI support or sync. No AudioBus, no JACK. Sometimes it’s hard to access controls. A draggable menu shows up with different parameters to control on each pad, but going in and out of it can be clumsy. Ironically, the 3D Perform mode gives you dedicated controls for switching between tuning, length, filter, and gain, but other modes don’t. Let me be antisocial? CloudSeeder’s SoundCloud features constantly show you who’s uploading, nag you to share each time you record (until you tell it to please don’t ask again), and still prompt you for SoundCloud integration even if you want to export only to desktop (you can hit cancel). Enough, already. 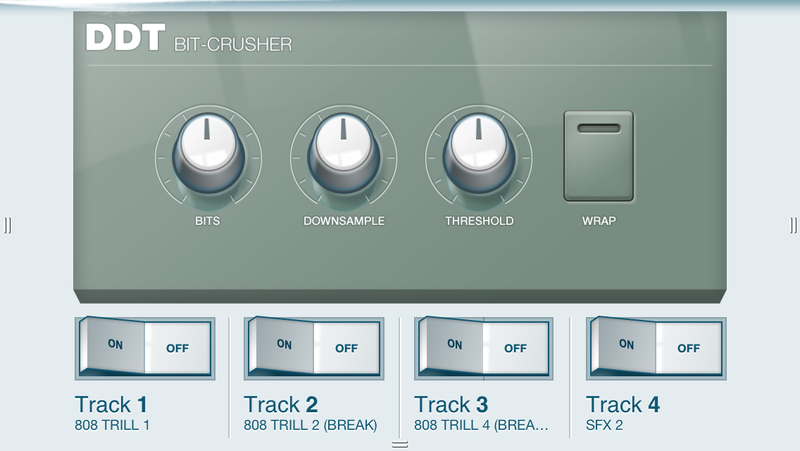 For drum machine lovers, this one’s an absolute must-have. 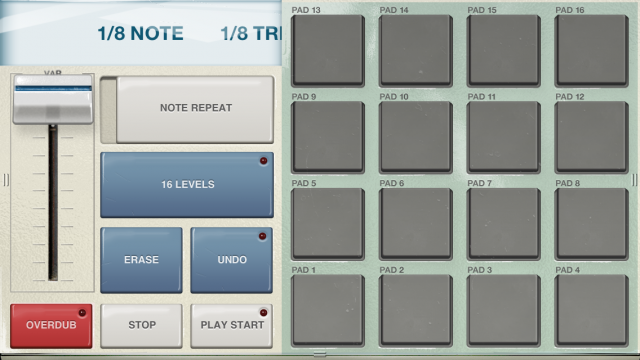 It’s fun to play, particularly quick for laying down patterns, and at $3 I’d have it alongside my other drum machines (like BeatMaker and iMaschine), if you’ve got room on your device. But there are some missed opportunities from Akai so far. iMaschine might be a little too simple to be useful. You’ll find an iPad vastly more usable than an iPhone in this case, because of the lack of screen real estate. The iPhone version could be more useful as a “satellite” to other drum machines if you had more control over triggering sample recordings and exporting those raw sample files. And while the iPad iMPC app supports Korg’s wireless Sync Start, Akai badly needs a drum machine app that supports real MIDI and MIDI sync. Lastly, while sharing is great, obtrusive sharing is not. In the meantime, iMPC is still a lot of fun. But I wouldn’t hesitate to continue to recommend BeatMaker as the most powerful solution around – and I eagerly await an iMaschine update someday. Stay tuned for more details on how the workflows function with Akai’s different software – I’ll be following up with that. Oh yeah, and Akai – I think I speak for countless drum machine lovers when I say I’d love to see new MPC hardware.